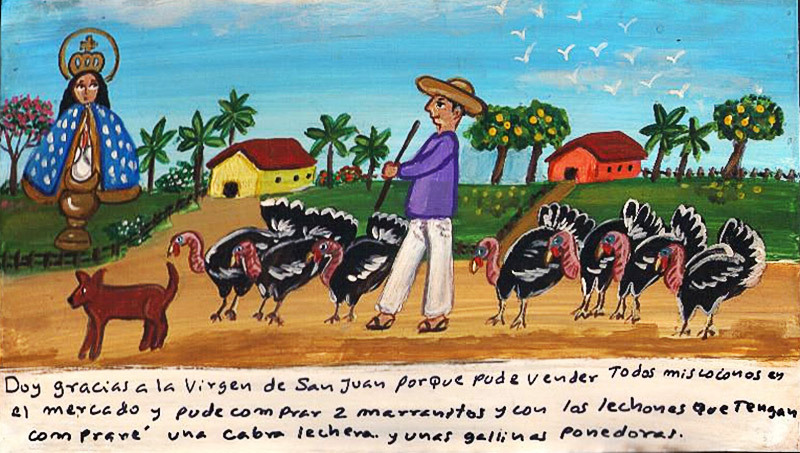 I thank the Virgin of San Juan because I managed to sell all my turkeys and to buy two pigs. Then I sold the piglets they made and bought a goat and some laying hens. 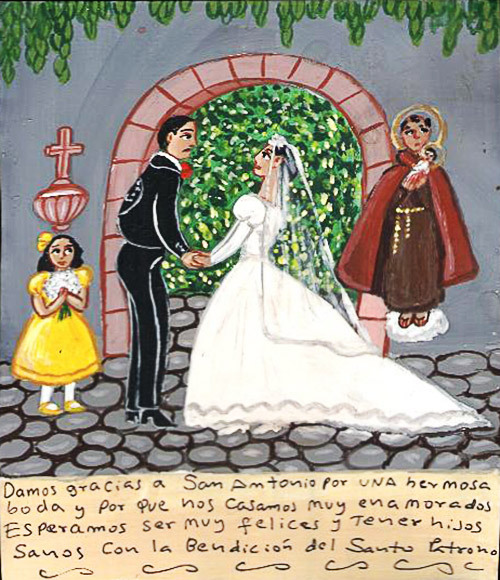 We thank Saint Anthony for a beautiful wedding and we played it being in love. We hope we’ll be happy and, with the saint’s blessing, we’ll have healthy children. My son Jesus lost in the mountains with the donkeys. My daughters and I are thankful to the Virgin of San Juan because four days later, after many our prayers, Jesus found his way back home. A beam of light guided him out and he returned safe and sound as well as his donkeys. 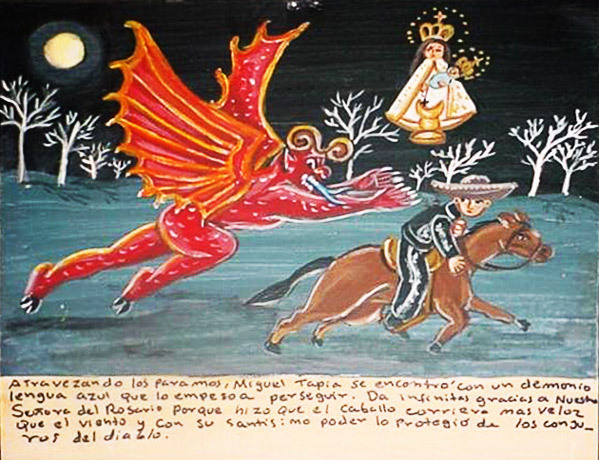 Miguel Tapia was passing the paramos and rode into a blue-tongued demon who began to chase him. 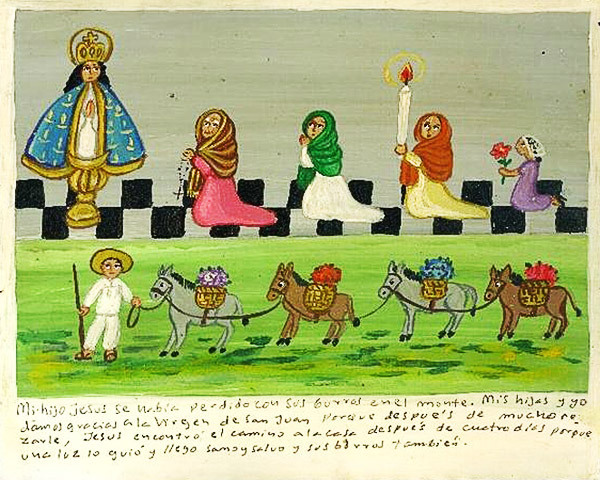 Miguel thanks the Virgin of the Rosary because his horse ran faster that the wind and the Virgin protected him from the devil’s spell. 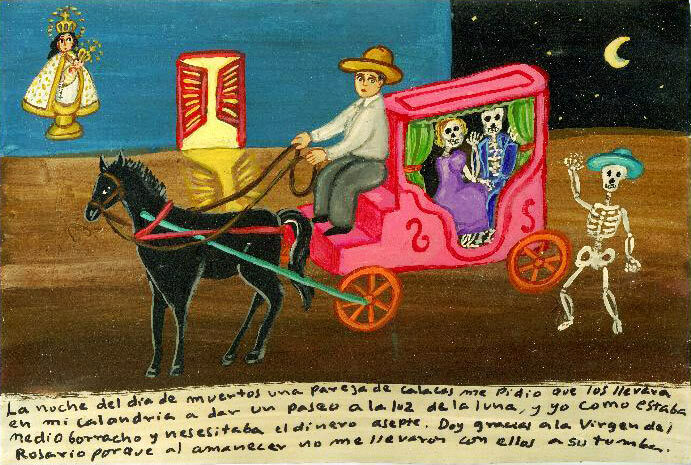 The night of the Day of the Dead, a pair of skeletons asked me to give them a ride under the moonlight. Since I was half-drunk and needed money, I agreed. I thank the Virgin of the Rosary for they didn’t take me to their graves at the dawn. I prepared some delicious food for the diner because my husband’s boss and his wife were invited. But then some damned squirrels got into the house through the window and ate everything. 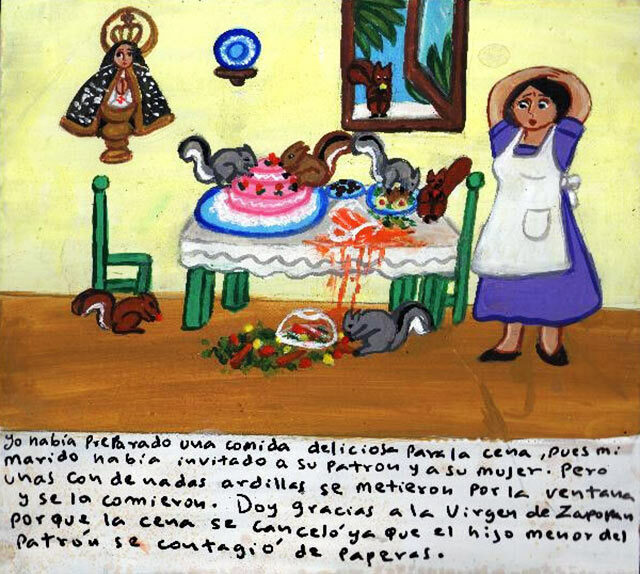 I thank the Virgin of Zapopan because the dinner was canceled since the boss’ youngest son got sick with mumps. 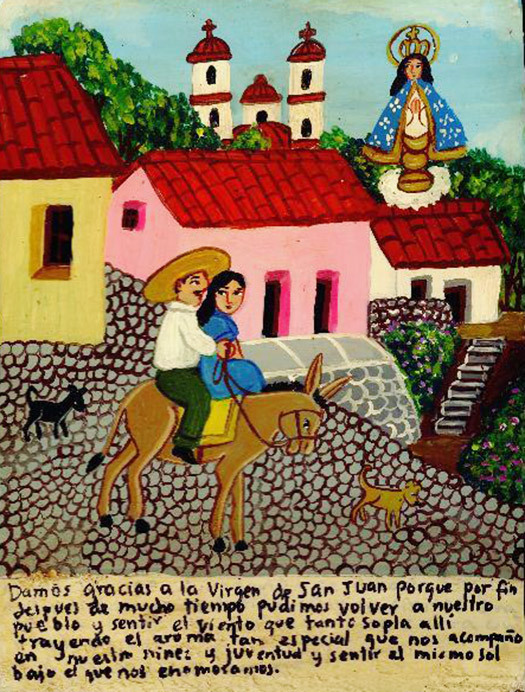 We thank the Virgin of San Juan because we returned to our home town after long time. We felt our wind with its specific aroma that reminded us about our childhood and youth. We felt the same sun under which we fell in love with each other once. My son Paquito had a fever. 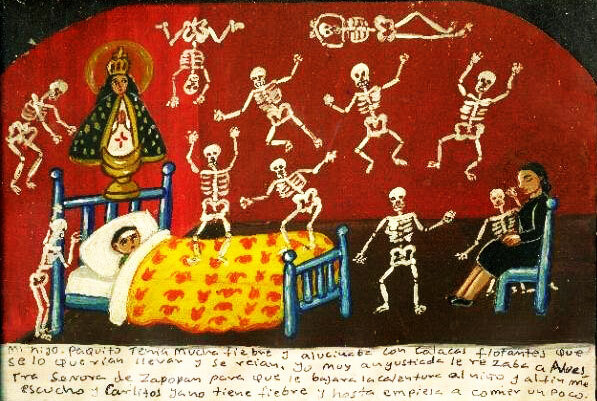 He had hallucinations with skeletons that were flying around him. They laughed and wanted to take him with them. 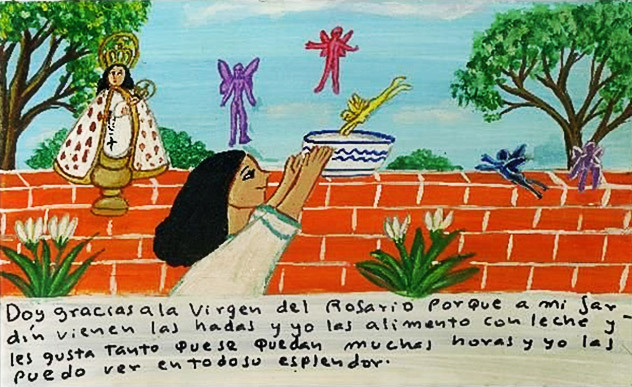 I was scared and I prayed to the Virgin of Zapopan, so she would bring down his temperature. Finally she heard my prayers. Carlitos had no more fever and even started to eat. I give thanks to the Holy Virgin. I thank the Virgin of the Rosary because fairies come to my garden. I give them milk which they love so much they stay in my garden for hours and I can admire them in all their splendor. 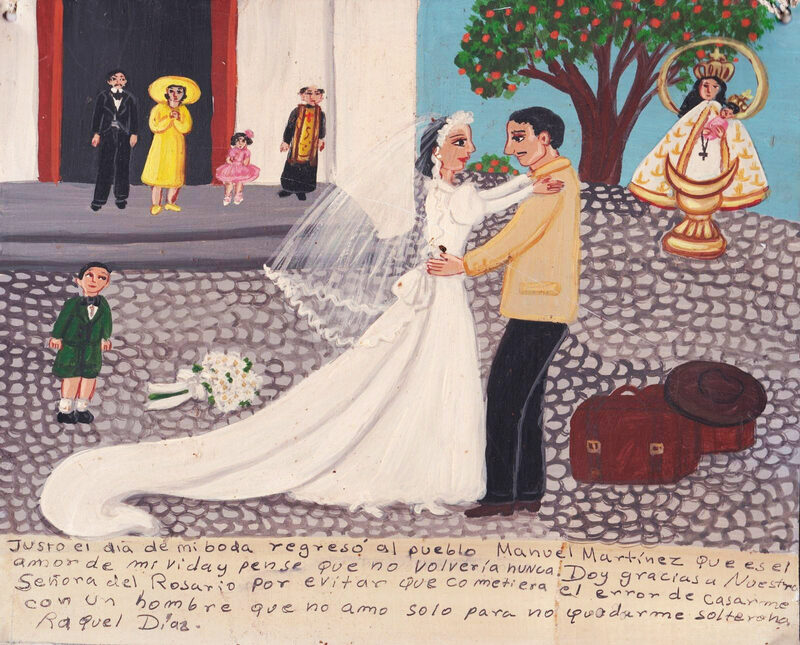 The day of my wedding, Manuel Martinez returned to the town. He was the love of my life, and I thought he’d never come back. I thank the Holy Virgin of the Rosary for I didn’t commit an error of marrying a man I didn’t love and only because I wouldn’t like to stay an old maid. 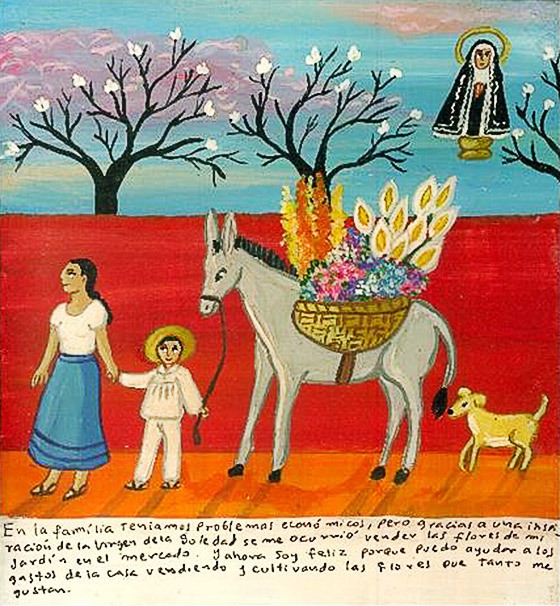 Our family had financial problems but the Virgin of the Solitude inspired me to sell the flowers from my garden at the market. Now I’m happy because I cover our expenses by growing and selling flowers which I enjoy greatly. 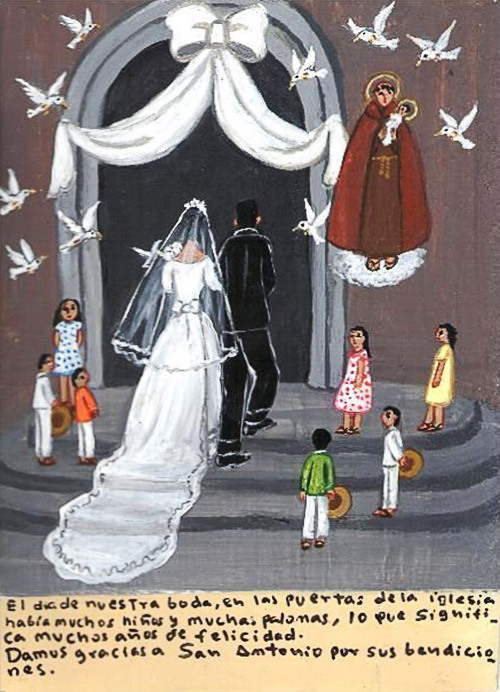 On the day of our wedding there were so many children and doves near by the church doors. It’s a good omen that means many years of happiness. We thank Saint Anthony for his blessing. I enjoyed going outside in the patio to read. One day a little girl came to me and asked me to read for her. Now I have many kids who come to listen me reading, and I love it very much. 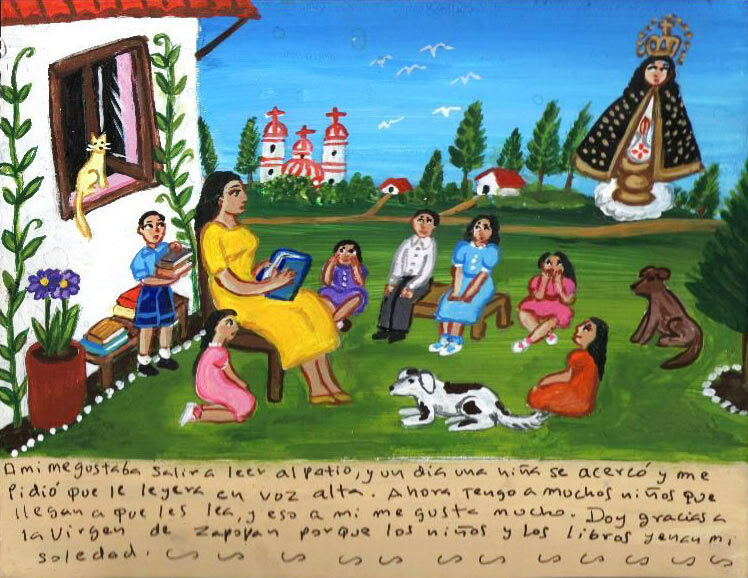 I thank the Virgin of Zapopan because the children and the books alleviate my loneliness.